How can rescues and shelters prevent high flight risk dogs from escaping from new adopters, foster homes and even their own facilities? And how can they correctly react when a dog does go missing? These next few articles will focus on this, starting on how a shelter or rescue can prepare their staff, foster homes, and new adopters for high flight risk dogs. 1. 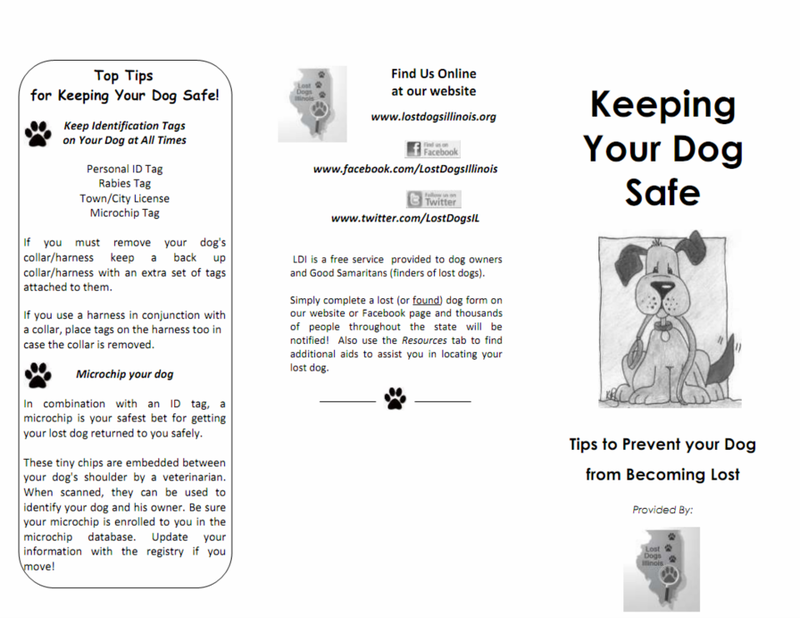 Microchip every dog as soon as it becomes available for adoption, and ENROLL the microchip to the new owner. Some microchip companies do this for free, others have a charge. Offset the cost by adding the enrollment charge (if there is one) into the adoption fee. Simply sending the dog out the door with the paperwork is not enough. Most people have good intentions but may lose the dog before they get the microchip paperwork sent in. They may have just plunked down several hundred dollars for an adoption fee and supplies. The microchip paperwork may get set aside until the next payday and by then it might be too late. 2. Put visible identification on every foster or newly adopted dog before it leaves. ASPCA research shows that 89% of newly adopted pets were still wearing the tags a shelter or rescue put on them six weeks after adoption. 3. 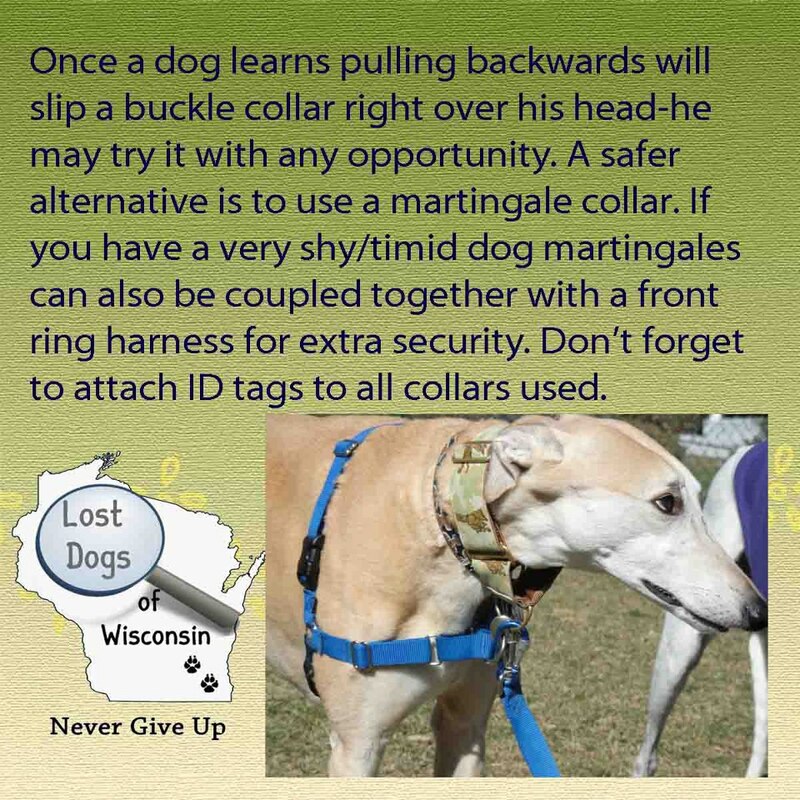 Use a martingale collar on every dog (see photo above). These are great for the shy dog that has learned to back out of a standard collar. Also, consider using a sensation harness along with a martingale collar (either by using two leads or clip the lead to both O rings) for those that are extremely high risk. 4. Educate your foster homes and new adopters on the challenges of high flight risk dogs. Remember, for many adopters this may be the first time they have owned a shy dog. Put together a packet of information for them to include in their adoption paperwork. Here is a sample from Lost Dogs Illinois that you can use. 5. Organize a team of volunteers and train them NOW so that when the unthinkable happens: a foster dog or newly adopted dog goes missing; they are educated and ready to mobilize so you don’t waste precious time. These are your first responders, what they do in those first few hours after a dog is lost can make the difference between success and heartbreak. Stay tuned, because next we will be focusing on the information you will need to train those volunteers so that you have the best chance for a successful recovery. 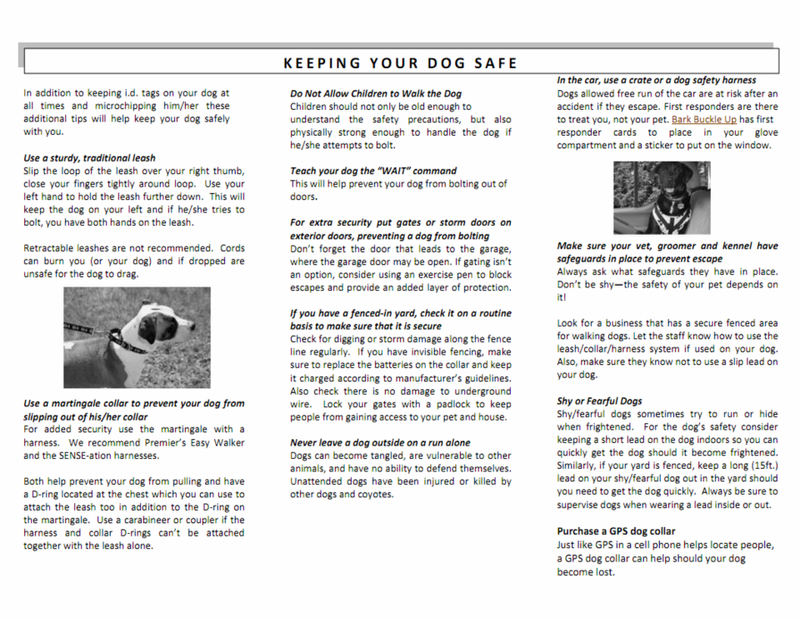 This entry was posted in Prevention, Rescues and Shelters. Bookmark the permalink.